Mary Rupert – Welcome to Wyandotte Daily! Enthusiasm is growing for the recognition of the Quindaro townsite for its historic value and also, for its tourism potential. An event at noon Tuesday, April 23, at the Quindaro Overlook will celebrate the Quindaro townsite’s federal designation as a national commemorative site. 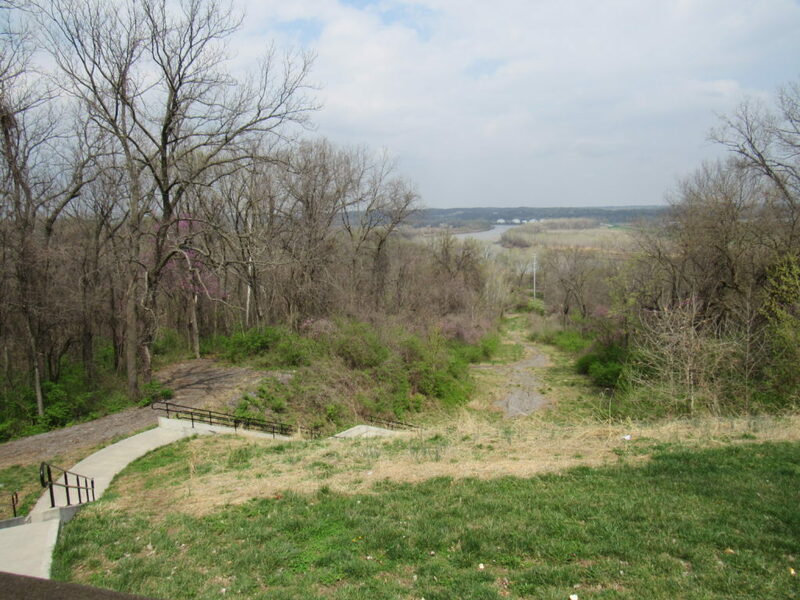 The Quindaro Overlook, 3507 N. 27th St., is north on 27th near the Missouri River in Kansas City, Kansas. The overlook provides a view of the Missouri River and the area where Quindaro, an abolitionist port town founded in 1857, served as a site on the Underground Railroad. On April 23, a prototype of a sign for the national commemorative site is expected to be unveiled, according to Freedom’s Frontier National Heritage Area. The designation establishing the Quindaro Townsite National Commemorative Site was signed into law on March 12. The event on April 23 will be sponsored by Freedom’s Frontier National Heritage Area, the Unified Government and the Kansas City, Kansas, Convention and Visitors Bureau. Among those who are planning to attend the public event are U.S. Sen. Pat Roberts, R-Kansas, U.S. Rep. Sharice Davids, D-3rd Dist., former U.S. Rep. Kevin Yoder, Judge Duane Benton of the U.S. Circuit Court of Appeals, Janith English, principal chief of the Wyandot Nation of Kansas, the Rev. Stacy Evans, Western University Association and Historic Allen Chapel AME Church, and Mayor David Alvey. Others who are expected to participate include Kansas Department of Wildlife, Parks and Tourism Secretary Brad Loveless and a representative of the National Park Service. “Part of the process for the eventual plan is to turn the site into connecting the Ruins with trails and walkways that would allow people to experience the splendor of the bluff overlooking the river, while having interpretive signs there, what it meant in the past and what it could mean in the future,” said Jim Ogle, executive director of Freedom’s Frontier National Heritage Area. A national historic landmark designation is one of the next goals for the historic site. Ogle said Freedom’s Frontier and others working with the project are currently in the process of review with the Department of Interior and the National Park Service. They have filed a formal application on behalf of the Quindaro partners to make the Quindaro Ruins a national historic landmark. That process sometimes takes years. If the national historic landmark designation is successful, and he believes there is every reason to think it will be, then the Quindaro Ruins may receive more funding for interpretive work from the National Park Service, he said. “National landmark status is the highest level you can get National Park Service participation in without it owning the property,” Ogle added. Freedom’s Frontier is not working toward anything that would suggest changing the ownership of the property just to enhance the ability to receive more money to develop it and tell the Quindaro story, he said. Another element that is in the future for the Quindaro Ruins are efforts involving the northeast development plan, as part of the EPA’s grant for the area, Ogle said. “The EPA has started a process of evaluating the area to see if there are any historic sites within the Ruins where they may need to investigate core samples to make sure there’s no environmental hazards that exist there,” he said. Last Thursday, members of the community came together at Allen Chapel AME Church, which has been looking after the site for many years for the Western University Association, the owner of the site, he said. They shared their ideas about what should happen after the initial surveys and after the site is brought to a certain level so people could use it as a park space, he said. Overwhelmingly, the people who attended that meeting supported tourism and telling the story of Quindaro, he said. The group will discuss signs to help people find their way, upgrades at the overlook site, upgrades for the Underground Railroad Museum, the old school and the Old Quindaro Museum, he added. Signs providing directions, interpretative signs, brochures, and audio walking tours will be discussed, he added. The Kansas City, Kansas, Convention and Visitors Bureau will be providing information on what makes a site tourism-friendly. Ogle said that while he knows of no further archaeological plans for the site at this time, given the extensive work that had been done 20 years ago, and materials that are already on file with the Kansas State Historical Society, that he expected others to make proposals along the way to investigate some of the sites that they were not able to investigate earlier. “I’m very hopeful about that,” he said. About 80 percent of the Quindaro Ruins area that received designation as a commemorative site is owned by the Western University Association, and about 20 percent of the area, including the Quindaro Overlook, is owned by the Unified Government, and is maintained by the Parks and Recreation Department. The AME Church and its members make up the Western University Association, and as owners they have a lot of say over what will happen to the Quindaro Ruins, he said. “They have been extraordinary partners over the last two years,” he added. The Quindaro town site is only the third national commemorative site, Ogle said. The town was named after Quindaro Nancy Brown, a member of the Wyandot Nation, who married Abelard Guthrie. During its heyday, Quindaro was an anti-slavery town with stores, businesses, a school, a church, homes, hotels, a saw mill and a newspaper, according to an article in the 1857 Quindaro Chindowan newspaper. Persons fleeing slavery could find a haven there, as they stopped on their way to freedom, although they still had to avoid bounty hunters. In 1865, Western University was established in the Quindaro area and operated through 1943. Quindaro was abandoned after the Civil War and its buildings were overgrown through the years. When there was a proposal to put a landfill on top of the Quindaro Ruins in the 1980s, archaeologists discovered significant historical value in the Quindaro Ruins. Freedom’s Frontier is a 41-county area in eastern Kansas and western Missouri covering about 31,021 square miles. Established in October of 2006, it was the result of legislation introduced in 2005 by Sen. Roberts and then Sen. Sam Brownback, and signed into law, establishing the heritage area. I’m sort of a dinosaur when it comes to the modern-day sensational reporting around us. I spend far more time on issues stories than I do on stories about the personal foibles of our local politicians or whatever the latest bad thing is that happened in our community. I have always thought that issues facing our community, or our state and the nation, are more important than the private lives of people who are in public life. I guess that makes me a dinosaur compared to some of my colleagues. I see from our readership numbers on Facebook, though, that these stories I spend a lot of time on are not necessarily the stories that people click on and read. Readers often tend to click on crime stories or other bad news. Perhaps we are in an era where readers have an appetite only for stories about “the next bad thing.” If so, that’s a pity. I don’t blame the readers. In fact, if I went to work one day and received an award, and on the way home, I had car trouble, which would I mention first when I got in the door? It might be the car trouble, as I could be very upset about it. That said, there are still as many “good” stories on our website, more than the “bad” stories. It’s people’s perceptions, sometimes, that there is more bad news than good news. And I continue to spend more time on the neutral or good stories, reading through documents and trying to present information to the public, than I do on the “bad” stories. As a student journalist back in the 1970s, I was always more interested in issue stories, such as some law that would affect students, or the latest proposal the student government was considering, than covering all the bad things people are doing to each other. That’s how it should be. News that is affecting the most people is more important in the long run than news affecting individuals. I go back to a time when we never really did very many stories about people’s private lives. I don’t much like the way coverage seems to be just centered around this now. I also admired Patty Dysart’s Armourdale political forums, where she told candidates to tell what they were going to do if they get elected, not to criticize the person they’re running against. That was good advice. A shouting match or a bunch of accusations never accomplishes anything. It doesn’t provide the essential information voters need to know about where the candidates stand on the issues. Stuff about the candidates’ personal lives is just a distraction, often, from the real issues of the campaign. Were you more worried about Hillary’s emails or about Donald’s tax returns than about their positions on the issues in the last presidential election? Then maybe you weren’t voting according to how their stands on the issues will affect your own life. “Nothing so needs reforming as other people’s habits,” Mark Twain once wrote. That probably applies today to Kansas City, Kansas, where a lot of people apparently are wanting to change other people’s habits. Maybe they should work on themselves first. Typically, in the election season some people will try to persuade journalists to do hatchet jobs on various opponents. Some of the reporters see the motivation in back of this and try to avoid being drawn into the middle of these manufactured stories. In an evaluation of the issues, personal attacks have no place. In logic class, they were called “ad hominem” fallacies. It’s true, at this tiny publication I really do not have the time to spend on all these manufactured crises aimed at getting someone elected. It’s also true that I really don’t want to do them. Sometimes readers would like to tell us that they think my job is to go out and report as much negative stuff as I can find about people, particularly about elected officials. I don’t think that’s my job. Although occasionally I do these sorts of stories, it’s not my idea of what I should do. I think it’s mostly a waste of time to get into the middle of these unimportant political disputes and personal accusations. It’s my job to tell people about the things that really matter to the most people. If that makes me a dinosaur, so be it. To reach Mary Rupert, editor, email maryr@wyandottedaily.com. Does anyone have $13,000 to spend every month on prescription drugs? That was a question asked at a forum today in Kansas City, Kansas, by a panelist who has leukemia. 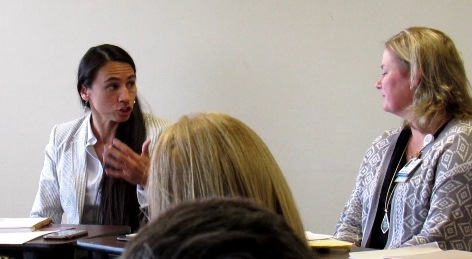 He told a group convened by Rep. Sharice Davids to discuss high prescription costs that some people’s prescription drugs can cost more than $100,000 a year. An increase in medication costs in the past several years for diabetes also was discussed today. National organizations have told one panelist they’d like to help patients with prescription drug costs, but helping them would bankrupt their organizations. The panel today discussed the increasing costs of some prescription drugs and their relationship to health care costs. 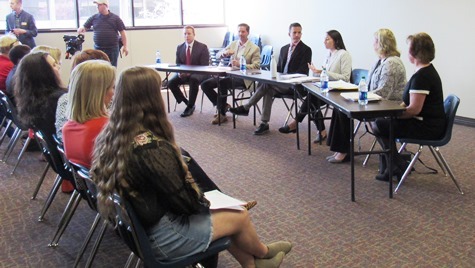 The panel, meeting at the Jewell Building at Kansas City Kansas Community College, included a CEO of health care clinics in Wyandotte County, a pharmacy director from a hospital, a cancer survivor, a mother of a diabetic patient, and others. The host of the panel discussion was Rep. Davids, D-3rd Dist. Patrick Sallee, CEO of the three Vibrant Health Clinics in Wyandotte County, where a significant percentage of patients do not have insurance, said Medicaid expansion in Kansas is a solution. More patients would be likely to go to the doctor and more specialists would be likely to see them, if there was Medicaid expansion, he said. Currently, his clinics are seeing some patients who either don’t go to the doctor because they can’t afford the visit or the medication, or who skip some of their doses or cut their doses in half because they can’t afford it. A small amount of medication is donated to the clinics, but not enough for all the patients. Jenifer Clausen, pharmacy director at St. Luke’s South Hospital, listed some reasons why prescription drug prices were high, including research and development costs, marketing costs, negotiated benefits, and drug shortages. The mother of a teenage daughter with Type 1 diabetes told the audience that the cost of insulin has doubled in the last few years, and was up to $1,500 to $2,000 a month for some patients. Some patients were rationing their insulin because of the cost and ended in the hospital as a result, increasing health care costs, she said. About 70 percent of the cost of insulin was from rebates given to pharmacies, according to the parent of the diabetic patient. Other topics, such as the ability of telemedicine to reduce health care costs, whether the secretary of Health and Human Services should have the authority to negotiate Medicare Part D prescription costs, and the role of pharmacy benefit managers, also were discussed. Rep. Davids said health care costs have been brought up by residents at all of the meet-and-greet events she has held in the 3rd District. While today’s panel discussion did not attempt to find an immediate solution for addressing prescription and health care costs, Rep. Davids said it helps her to know the issues faced by residents and to gather information that can be helpful in future legislation. She said her goal is to listen to the constituents and learn about the issues. She encouraged residents to contact her office to discuss any issues they may have with the federal government, including Medicaid issues, health care issues, and other topics of federal legislation. Rep. Davids earlier announced her support of a bill that would reduce health care costs and protect people with pre-existing conditions. Residents who want to make their views known about federal issues may contact Rep. Davids’ staff at her offices including one at 753 State Ave., they may phone the office at 913-766-3993 or they may email her through the website at https://davids.house.gov/zip-code-lookup?form=/contact/email-me.